Order within 13 hours 5 minutes and it Ships Today! A dark brown base with eye-grabbing auburn hues. Penny-colored tones warm up the whiskers and reflect a fiery auburn-orange in direct light. Our classic brown Henna/Indigo Fusion is designed to bring in the brilliant ginger tints just enough to hug the smooth brown permanent base. A spectacular look. Subtle on brown beards, more vivid on blonde beards. *You can dye hair & beard with the same packet!—Do it. A dark brown base with eye-grabbing auburn hues. Penny-colored tones warm up the whiskers and reflect a fiery auburn-orange in direct light. 1 Packet (3.5 oz/100g) will dye average beard up to 5 times. 1 Packet can dye: hair, eyebrows, sideburns, mustache, and beard at the same time (average hair & beard length). Our classic brown Henna/Indigo Fusion is designed to bring in the brilliant ginger tints just enough to hug the smooth brown permanent base. A spectacular look. Subtle on brown beards, more vivid on blonde beards. *You can dye hair & beard with same packet!—Do it. Ingredients: natural henna, natural indigo, false daisy, centella leaves, myrobalan seeds, beleric seeds, red clay…(that’s it). Natural henna, natural indigo, false daisy, centella leaves, myrobalan seeds, beleric seeds, red clay. Facial hair holds more natural oil than hair on your head and food/drink/moisturizer residue tends to linger on the whiskers. All decrease beard dyeing quality. You have to cleanse the whole beard-area thoroughly. An all natural high-lather soap is recommended for proper cleaning. Gentle washcloth or soft face brush recommended (don’t irritate the skin surface). Pat dry all facial hair to remove excess water. Slightly damp whiskers are best. Mustache = 1 rounded tbsp. Goatee = 2 rounded tbsp. Full Beard = 2 to 4 rounded tbsp. Use small bowl and spoon to mix. Add enough hot water (approx 120º F) to make a paste resembling thick pudding or cake batter. Mix very well. The paste should be thick enough to adhere but thin enough to spread. Store extra dry powder in air-tight bag/container and in a cool dry place. NOTE: Excess mixed paste must be discarded (expires rapidly, zero preservatives). TIP: Colors with indigo (all black & brown dyes) may benefit from little stand time prior to application. After mixing, allow paste to stand for 10 minutes*—no longer. Mix well again (no extra water), and apply. *May help deepen the stain by pre-oxidizing the indigo. Use included glove to apply paste to whiskers. Start from mustache and work down to chin and then up to sideburns. Spread generously through all whiskers—cover them completely. Rinse clean with warm water only. No soap on beard for 12-24 hours—just use warm water. Avoid washcloth on face for 2 days. For more application instructions, how to spot test, and gray coverage process go to our detailed application page. I give this product 5 stars with a couple of warnings to the silver bearded folk. A little about my hair, my beard started graying in my early 20’s. It was originally a deep chestnut brown with some copper red highlights. It is now completely white (except in the mustache). I’d been using a common drug store beard dying product (light to medium brown) to color my beard to reflect my actual age. It burned, of course, and caused skin irritation for a few days. The color was flat and lacked the reds I was used to. I decided to use the copper brown henna beard dye, since my beard was already dyed brown by the drug store brand. SILVER BEARDED FOLK DO NOT DO THIS. I learned the hard way, if your beard is white/gray/silver–even if you used a drug store brand dye treatment and it is now medium brown–the henna treatment will strip that brown out and your beard will turn flaming orange (just like the little color swatch says it will if your beard is blonde/platinum). 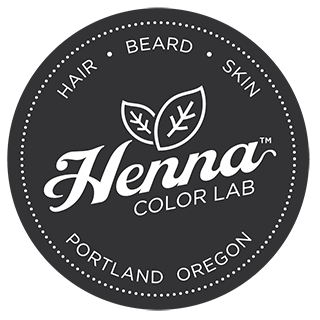 Second exception, and something I think Henna Color Lab should address in the beard dying instructions. My beard is a touch longer than Chuck Norris’ beard. I used the prescribed amount of dry mix and slathered my beard up with this excellent pudding which dripped all over the towel wrapped around my shoulders (USE THE TOWEL). With every whisker covered from root to tip, I still had 3/4s of a bowl left over. Trial and error, I suppose. Great stuff. After seeing my flaming beard. I promptly order Mahogany and some other browns to play with. This is definitely a five star product! I have dyed my beard with Just For Men for years, so it would look more uniform. The problem was that it looked too uniform. It lacked the subtle variation of colors that naturally thick beards have. The copper brown henna provides uniformity for a thicker look, but it doesn’t look artificial. Plus, everyone says henna has health qualities for hair and skin. I tend to be a bit of skeptic, but my beard certainly looks and feels better without using synthetic dyes! PS If you have the time, you can leave the dye on for more than one hour. I like to leave it on for 2-3 hours for a more vibrant effect.